I have such a love of candles. I own far too many candles that I never burn because I have some weird thing about keeping things looking new and never using them because reasons (I'm looking at you, 5 sets of Derwent pencils still wrapped in plastic). Once I inevitably get over this weird quirk and light them, I'm quickly captivated by them as the flame dances on their molten surface. I love their elegance, their ambiance and their beauty. I especially love their fragrance, be it from a scented candle or the smell of a wick just blown out. I also love the way they remind me of being a kid. I grew up in a household where money was variably present, and so we often had one or more of our utilities cut off. Of course, as a kid, you don't yet know the stress of money and bills so it's all just another adventure. Today we get to boil the water for our baths on the stove and read stories by candle light. There were a lot of candle light nights. Maybe it's because they bring me back to this time of personal innocence, or maybe it's just their intrinsic beauty, but I find them so calming. Candles also remind me of Christmas. They're my favourite centrepiece at Christmas dinner, though they look gorgeous adorning any occasion. Lit or unlit, they make the setting look beautiful. 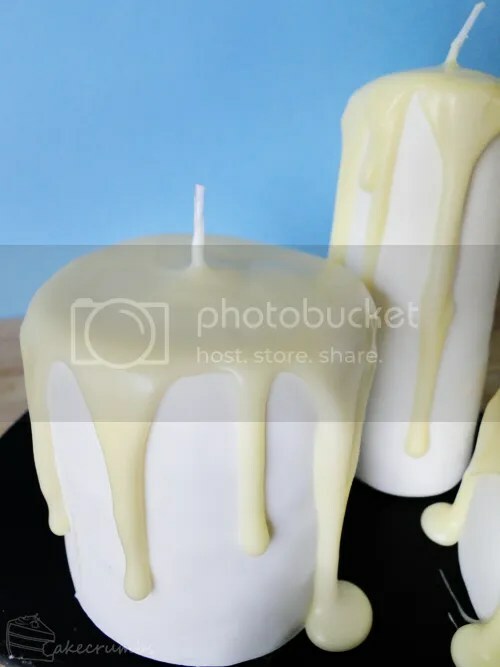 So when creating a list of baking for my 12 Days of Christmas, I just knew candles had to be featured. 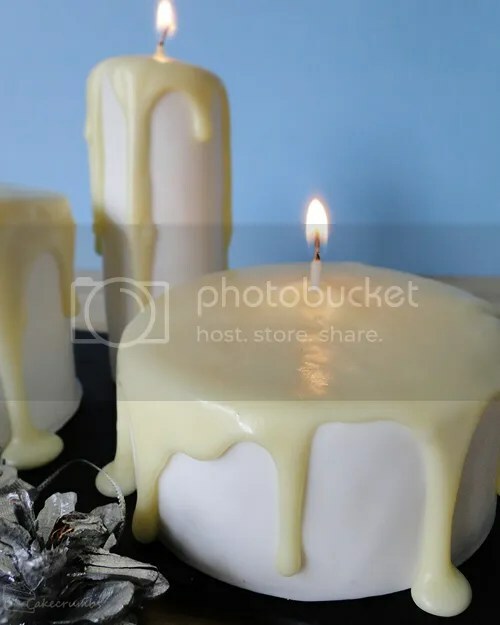 These candles are made from white chocolate mudcake. This is a recipe that is in several of the Women's Weekly books I have. I've often seen it, but usually skipped it. I seldom have the urge for white chocolate cake. In fact, I've never baked it. Once I tasted this cake, I realised what a mistake it was. This is hands down one of the most amazing cakes I have ever tasted. 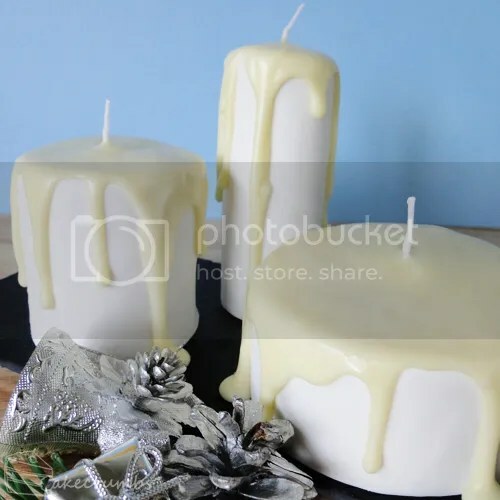 I didn't need all the cake for these candles, so I cut off some pieces warm out of the oven for everyone to try. I saw my own feelings of surprise and ecstasy reflected in the expressions of everyone who took their first bite. Even the crust, which is quite thick on this cake given the 2 hours baking time required, was perfect. Beautiful and crisp, while slightly sticky and syrupy, you just wanted to eat every last bit of it. 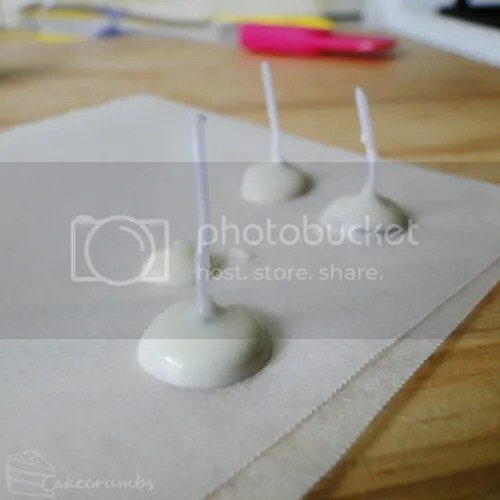 If you don't want to make these candles, then just bake the cake! I'm definitely just waiting for an excuse to bake it again. If you are making the candles, then you'll need to cut our rounds that correspond to the size candles you want. I used three different sized cutters and cut 1 round for the largest candle, two for the middle candle and three for the tallest candle. 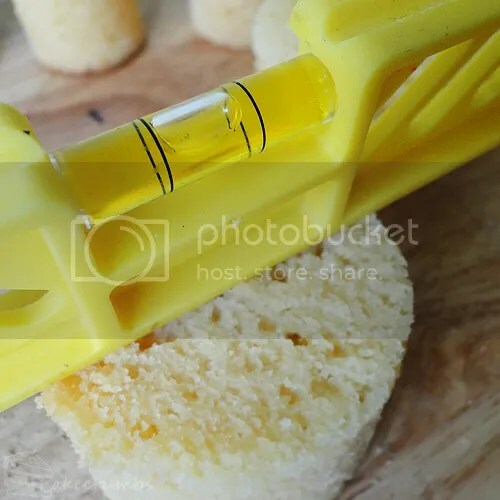 Cut off the crusts and level the cakes. 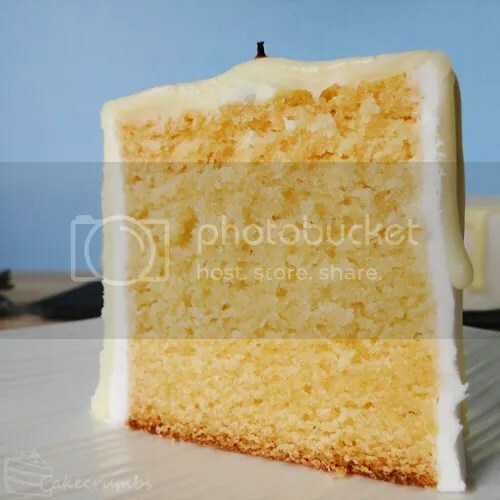 Because I'm pedantic, any time I'm stacking cakes I use a spirit level to make sure they're level. Now to make them a candle. 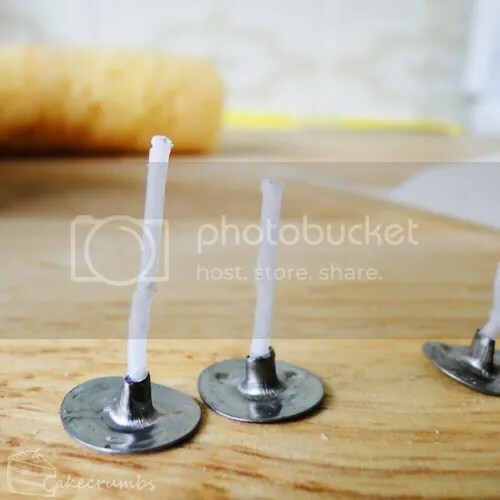 I got a cheap packet of 100 tea light candles from Bunnings and removed the wicks from three of them. To make them food safe, I coated them with white chocolate. At this point, you can ice the sides of the cake using your preferred method; royal icing, fondant, buttercream, ganache. Play to your strengths – you just need to get a smooth coat of icing on the cake. Use a bit of ganache to secure the wick to the top of the cake, then drizzle the rest on top letting some of it drip over the sides. If you want the colour to be really stark you could use actual white chocolate melts (the kind found in the chocolate making section) or use white food colouring. I just used what I had on hand. And now the moment of truth: lighting the candles! Without the wax, the moment will be short-lived. You could recess an entire tea light candle into the cake, but I preferred the look without it. It matters little, because this cake is so delicious, the whole thing is going to be short-lived anyway. Preheat oven to 160­°C (140° fan-forced). Grease and line a 22 x 33cm lamington tin with baking paper. Place butter, chocolate sugar and milk in a medium saucepan; stir over low heat until smooth and well combined. Remove from heat and allow to cool to room temperature. Whisk in sifted flours, then the essence and eggs; pour mixture into prepared pan. Bake for an hour; cover the pan loosely with foil and bake for a further hour. Remove foil and stand cake inside tin on a wire rack to cool for 10 minutes, then turn it out of the pan to cool completely. To make white chocolate ganache, heat cream in a small saucepan over medium heat until boiling; remove from heat and stir in chocolate until mixture is smooth and well combined. Cool! They would look great on a Christmas table! Since you’re messing with white chocolate I must ask, do you have any tips you could share for keeping a white chocolate rocky road nice and firm like it’s regular dark chocolate counterpart? The last time I tried it was goopalicious and I want to make a cranberry and macademia white choc rocky road for Christmas! Having only made rocky road once in Year 7 home economics class some 12 years ago, I’m not a lot of help! I really should fix that. But if it’s any help, when you make white chocolate ganache with white chocolate you usually need to use a higher amount of white chocolate to cream than dark chocolate ganache to get the same consistency. That said, most recipes for rocky road I’ve seen seem to use the same amount of white chocolate as the dark choc recipes. btw but I’m not good as you! Thanks so much! I’m sure you will do a fantastic job of it! I have a question. Why does it take this cake so long to bake? I know most of my cake box mixes only take under a half-hour but I wanted to stop making box cake and move onto homemade cakes instead. I’m from America so I have to do a lot of converting and rounding. I don’t have the type of sheet pan size your recipe calls for, I only have 2 round cake pans and small square pans. I’ve never dealt with a cake that bakes for 2 hours so I’m unsure how to do it. Also, what is “caster” sugar? I’ve done a google search but there are so many confusing answers. Some say it’s granulated sugar, some say it’s white sugar, others say it’s bakers sugar. 😦 I’d love to try this recipe but I’m hitting a couple road blocks. Is vanilla essence the same thing as vanilla extract? Sorry for all the questions! 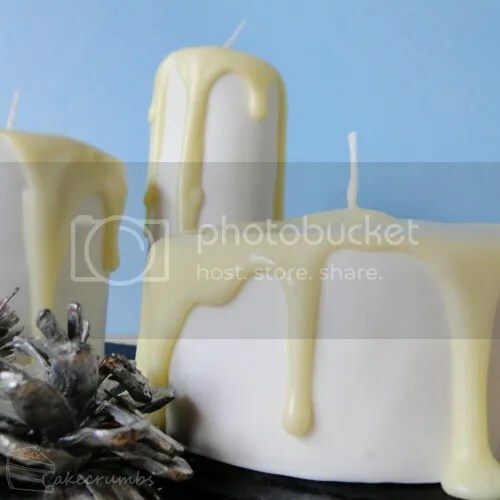 This cake is beautiful and they look like real candles! You really do a wonderful job with presentation. Most cakes do not bake for so long so this one is quite unusual. It has a lot more cake batter than most cakes and is quite a moist cake, so you bake it at a lower temperature. for longer to make sure this middle is cooked. If you baked it at 180 like most cakes, it would burn on the outside before the middle cooked. 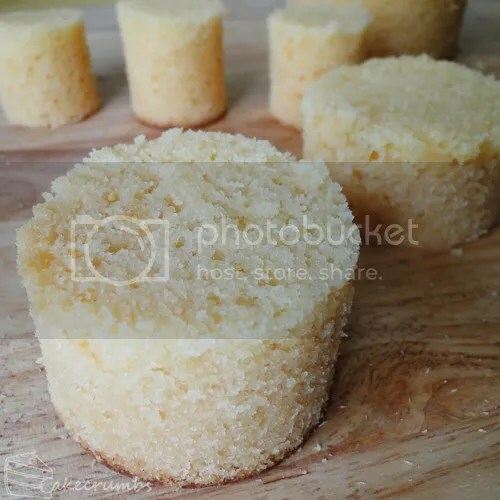 Caster sugar is what I believe you guys call superfine sugar. It’s just regular white sugar that is a finer grain. It’s often used in baking as the finer grain means it melts quicker. Vanilla essence is the cheaper, weaker, artificial version of extract. It’s more commonly used because it’s so cheap. You could sub it with vanilla extract no problem. Let me know if there’s anything else you need to know!